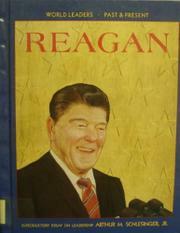 A harsh view of Reagan and his career: Not particularly gifted intellectually, Reagan found success as a Hollywood actor, as a spokesman for GE, and later as a politician--accomplishments seen here as the product of a malleable personality and an excellent memory (which failed him, the author ironically points out, when he testified in the Poindexter trial--as it had 28 years earlier in a Justice Department investigation of his talent agency, MCA). Reagan's rise from humble beginnings to head of a presidential administration "corrupt beyond measure" is charted in some detail, as are his family life, his finances, his lifelong drift to the political right, and his legacy of political and economic shambles. Schwartzberg sums him up as being less a person than a performer, with a very simple world view--a man completely dependent for his public decisions on advisors and spin doctors. Other recent biographies, e.g., Devaney's Ronald Reagan, President (p. 929/C-169), take a very different view; it may be too soon to expect an impartial assessment. Dark, sometimes poorly cropped b&w photos; brief, timely bibliography; index.